I registered for this race in November of last year for $45. Great deal right? The host hotel, The Seaport Hotel, was sold out so I searched for weeks for an alternative hotel. 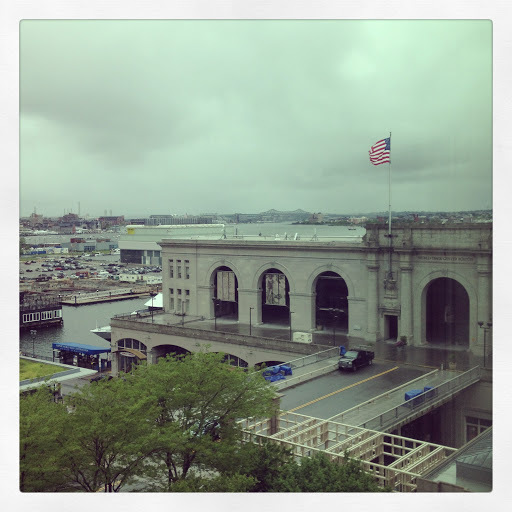 I was put on a waiting list for The Seaport Hotel and decided to stay at the Hyatt Harborside. On Wednesday afternoon I got a message that there was a room available for me. That made me very happy. I arrived in Boston on Saturday morning. It was a gloomy day. Luckily my room was available so I left my suitcase in the room and went to the expo which was across the street from the hotel. Not too many vendors were there but I bought a running skirt and two shirts. I paid $30 for the skirt and one of the shirts. Great deal! 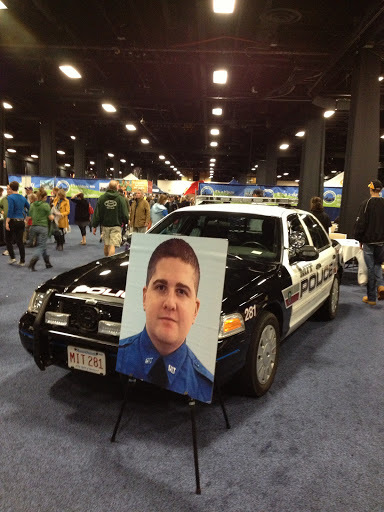 There was a dedication for Officer Sean Collier. I was up at 6am on race day. I love staying at hotels in which the start line is right across the street. In my race packet there was a note letting us know that security was going to be tight and that we would be searched. I understood the reason behind it but it just felt weird. There were so many people and everyone was happy and excited about the race! It was really crowded at the beginning of the race. About 3/4 into it, I took off and passed a group of Marines. So handsome! 🙂 I made it my mission to finish before them. We ran next to the Charles River. This part of the course was mostly flat, calm and peaceful. 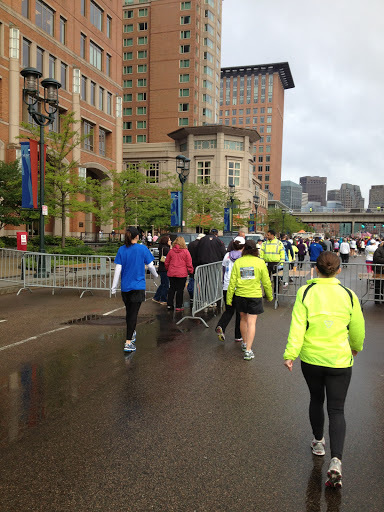 We passed a group of police officers cheering and giving high fives to the runners. The turnaround point was past Harvard University. Such a beautiful campus! As I turned around to head back I saw the Marines pass me up. Darn! I could not keep up with them. By then I had eaten one GU, drank plenty of water and Gatorade and was already tired. 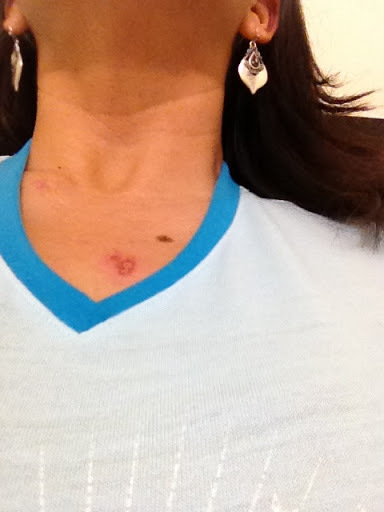 I had some pain on my right side and was chafing in my chest area. I found a medical tent and rubbed some vaseline to help with the pain. 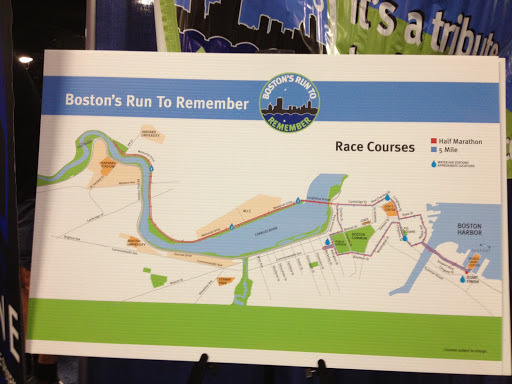 The last 3-4 miles we ran through Beacon Hill, the Public Garden, and Boston Common. We passed the “Cheers” pub and laughed when I heard someone asked “Does everybody know your name?” By then the sun was out and I was a little warm but knew I was close to the finish line. At mile 12, I saw the group of Marines and cursed myself for not keeping up with them. They were cheering the runners and that motivated me to keep on running. As I turned on Congress Street I knew I was even closer to the finish line. Another turn to Seaport Lane and I could see more people cheering. I could see the finish line! I ran as fast as I could and was finally done. 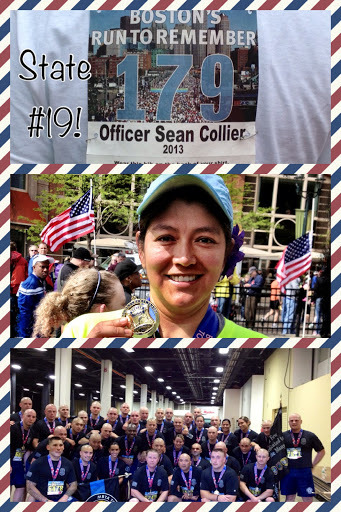 I went inside the World Trade Center to get some water and my medal. There were boxes of Zico coconut water and people were taking one bottle and others a whole box. I drank one bottle and took two more for the trip home. I got my medal and was about to walk out when I saw the group of Marines. I noticed they were just getting their medals. I realized that when I saw them earlier they hadn’t crossed the finish line. They were waiting for the rest of the group in order to finish together. That brought tears to my eyes. It was a great race. I had a great time and loved every minute of it. Congrats on state #19! Sounds like a fun race. I plan to run Boston soon. BTW, have you ever thought about using airbnb? I use them when I travel. It's a cheaper alternative than staying in a hotel and definitely better staying in a hostel. Sounds like an AMAZING race and congratulations on State #19! I loved hearing about how the Marines waited to cross the finish line together as a group. Brings tears to my eyes, too! Congrats on #19! I haven't done Mass. yet…this one looks like a great one. Thanks Rhoda for the suggestions. I've never heard of it and will look into it. Make sure to stay at The Seaport Hotel. Very convenient. You should run this race too.